When Chile first laid claim to the port city of Arica in 1880 following its victory over Peru in the War of the Pacific little did they know that not only were they now holding a key trading location but they had inertly seized one of the best and heaviest waves in the Latin Americas if not the world. With "El Gringo" being highly regarded as one the the heaviest waves in South America it has been sitting high at the top of my bucket list of surf spots to document for a long time now and with the arrival of the APB (Association of Professional Bodyboarders) World Tour to the North of Chile for the 2017 Arican Chilean Challenge it was now high time to cross it off that list. Arica! I made it, Amish beard and all. Much of my well spent youth consisted of watching bodyboard movies on repeat while simultaneously thumbing through page apon page of well worn bodyboard magazines many of which featured El Gringo on a regular basis. As a young skinny salty sunburn grommet I always dreamed of one day visiting the cold shores of Chile and giving this famed wave my best nudge. Fast forward to twenty odd years later and a slightly older, arguably wiser well weathered version of my teenage self was deep into the South American leg of a two year long journey down the Pacific coast of the Latin Americas. I knew at some point I would make the pilgrimage to the infamous surf town of Arica which sits on the fringes of the Atacama desert in the most northern reaches of Chile. I was hoping to time arrival perfectly not only with peak swell season (June-November) but also with the Arican leg of the World Bodyboard Tour (APB tour). Ecuador's Michael Duque pumped for the trials. Plenty of perfect bombs on offer throughout the contest. Reckless abondon on virtually every wave, standard Jacob Romero really. Spitfire, Triple overhead and perfect. On the first day of the contest window the competitors were greeted with a maxed out stormy and dangerous swell in the triple overhead range and ultimately the event was put on hold for the day and rightfully so. Thus the first day of competition was held in very solid and gnarly 8-10ft plus waves. The rawness of the swell was making for very testing conditions for the competitors but there will still plenty of gems on offer if you found yourself in the right place at the right time. Standouts during the early rounds were the usual suspects of Jarred Houston, Tanner McDaniel, Jacob Romero and Dave Hubbard as well as host of South America and local Chilean chargers who were not shying away from any possible chance to boost and take flight on one of the world’s most unforgiving waves. Legend has it that this widow maker of a wave located on the tip of the Alacrán Peninsula was largely overlooked and left virtually unchallenged right up until the 1970s. The story goes that this wave was first tackled by a brave and adventurous American surfer and thus the spot was aptly named "El Gringo" although in recent times patriotic Chilean surfers prefer to refer to this evil slab as "Flopos". Since then this ominous wave has gone on to forge global notary largely due to the Rip Curl Pro Search surfing event taking place here in 2007 and along with countless events as a mainstay on the World bodyboarding tour (now APB tour) and now also as apart of the WSL (World Surf League). World Champ Pierre Costes was a standout throughout the event, here he is with a huge 720 air reverse attempt. Pure madness from the Frenchman. Dave Hubbard struggled to find the waves he needed and was a shock elimination in the early rounds. Do I look confident to you? Nah I didn't think so. On the third day the contest was blessed with a mellower and somewhat fun 4-6ft+ glassy conditions and thus making it more than perfect for water photography. Secretly one of my major reasons for making the long trek from Peru for the contest was with the hope of being able to shoot from the water during the event if the conditions and event organizers would allow it. I have to admit I was pretty nervous when I first approached the event organizer Alex Leon for permission to shoot from the water and I made my best effort to make it sound like I knew what I was doing. Surprisingly he gave me permission to shoot as long as promised to respect the competition zone and stay out of the line of sight of the official event water photographers. I was half frothing and half shitting myself as I had not previously shot from the water here and I was totally dreading the super sketchy rock-off required to enter the wave arena. The last thing I wanted to do was to get obliterated in front of a crowd of 300 plus people yet inside I knew I had to get out there regardless. El Gringo is a wave I had always dreamed of experiencing from way back when I was a frothing little grommet and I would totally kick myself if I did not take up this once in a lifetime opportunity. Nervously yet patiently I sat next to the rock-off spot praying that I would pick the perfect moment for a well timed swim out and not a free trip to literal obliteration on the dry rock shelf. I had spotted a good looking lull and with a rush of blood to the head I made the split second decision to make a break for it and I blindly plunged into the narrow rocky keyhole channel and the frigid waters of the Chilean Pacific coast. Instantly the freezing water knocked the wind out of me and I was being rapidly surged over almost dry rock shelf by the fast out flowing water. It felt like I was being washed out to sea by white water rapids that you would only usually experience in a flooded river. After fortunately only having to duck under one wave I soon found myself sitting safely although somewhat breathless in the channel next to professional surf photographer Pablo Jimenez ( who for the record is a complete legend), the hardest part was now over. My last shot right before I was about to rock-off. Tell my mother that I love her. Iain Campbell locking into a screamer. Arican local Kevin Torreso getting amongst it with solid performances. Dave Hubbard still smiling despite lucking out. This session was one of the major highlights of my surf photography experiences to date. To be out there rubbing shoulders with the best in the business at my childhood dream wave was a moment I will never forget and definitely a dream come true for me. After the days surfing had finished I was even lucky enough to blag a free ride back to shore on the contest jet-ski and thus avoiding the somewhat sketchy return on the rocks. That’s it! I had done it! I had achieved my childhood dream of shooting from the water in Arica and had even made it safely back to shore in one piece. STOKED! I was so grateful to the APB for being so cool as to allow me to capture all the action from the water and achieve this dream. The APB may of received some bad press in recent years but despite a few setbacks I felt that they did a very solid job in Arica. As I was there with my friend and APB competitor Michael Duque they allowed me to witness the event from inside the competitor zone. I was literally sitting shoulder to shoulder with some of the biggest names in the sport. What really blew me away about these pros is how down to earth, approachable and friendly they all are. I was just some gringo that had randomly rocked up to watch the event and I soon found them greeting me, introducing themselves and shaking my hand all despite my best efforts to keep a low profile and give them space. The crowd prepares for the final. Chilean local Alan Munoz going balls out in the heaviest move of the contest. You have to feel for Iain Campbell scoring barrels like this in the final and still coming 4th. The swell was to jack-up again for the final two days of competition and with the final day being held in epic 6-8ft plus glassy as f@%k flawless conditions. The conditions were up there among quite possibly some of the best waves I have ever witnessed in my life and to be able to score waves of such quality in a contest like this is truly epic indeed. Some truly amazing surfing went down during the day in dream bodyboarding conditions but in the end only four remained being Pierre Costes (France), Iain Campbell (South Africa), Roberto Bruno (Brasil) and local Chilean Alan Munoz. A good sized local crowd had turned up to witness the final which is teastment to the amazing popularity and support bodyboarding experiences in Chile and South America. An abundance of top level bodyboarding was being showcased to apease the rowdy crowd who were happily laping up every dramatic moment. Once the dust had settled reigning 2016 World Champion Pierre Costes was convincingly crowned victor. The Frenchman was absolutely unstoppable on the final day and capped his winning performance with long deep barrels and a ridiculously huge air forward 360 spin. None could argue that the Frenchman thoroughly deserved to experience the sweet taste of victory thanks to his next level performance in next level waves. [Contiuned below]. Pierre was litterally unstopable on the final day. Massive air forward was the joker up Pierre's sleeve. Yup nailed it like a boss. 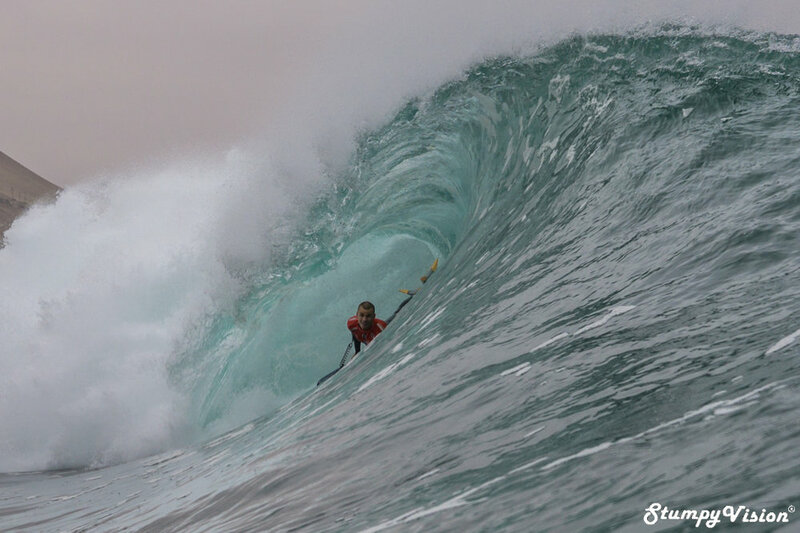 The contest was a great spectacle to behold and featured insane levels of bodyboarding in some truly epic conditions. I feel the success of the 2017 Arican Chilean Challenge will do the public image of bodyboarding and the APB tour a whole world of good. I had an amazing time in Arica and it is such a special little town with friendly people and not so friendly waves. It was great to finally realise my dream and make it to this famed wave for the contest. If you ever get the chance to visit Arica and the North of Chile definitely snap it up but please do not forget your big wave boots and a solid set of gonads! All hail the King! The look of quiet satisfaction.